Jordi Maxim van den Bussche is best known as as YouTuber Kwebbelkop, but he’s got a new venture underway in Webble Games – a Dutch studio focused on building simple arcade games with a focus on community and watchability. The developer’s first game, Havocado, is set to launch next month, and it looks like a perfect storm of multiplayer ridiculousness and YouTube friendliness. Havocado looks a lot like Gang Beasts – both games feature simple, primary-coloured characters trying to knock one another off of ridiculous stages. 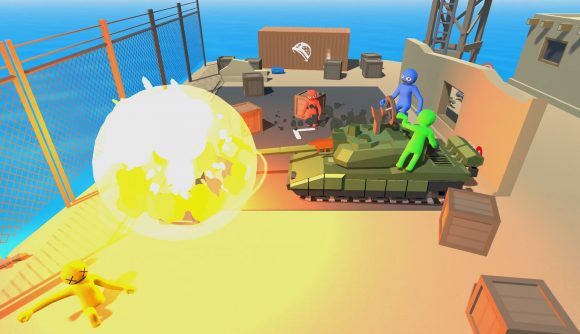 This game puts a greater emphasis on weapons and vehicles, giving you the option of picking up assault rifles and RPGs or hopping into a tank for more destructive potential with the wacky physics engine. You can get a taste of what to expect from the trailer below. The game is set to launch in Steam Early Access on April 25. The final version of Havocado will release about six months later, and it’ll get a host of new levels, items, modes, and other features in the meantime.